As I (hope to have) covered in last weeks blog, the government-funded development at Tlatelolco, opened in 1964, formed by far the most ambitious housing project in Mexican history. In terms of a single site, its scope has never been matched. In 1968, only 4 years later, its Plaza de las Tres Culturas would play host to a horrific government massacre of student protestors and in 1985, the concrete housing blocks saw some of the worst damage of that years destructive earthquake. These two events—natural and deeply unnatural—demolished the political and social scenes of the city, and primed the city for an increased flow of residents to the suburbs. As this suburban movement continued to accelerate through the second half of the 20th century, many of its roots were expanding from the massive experiment here. 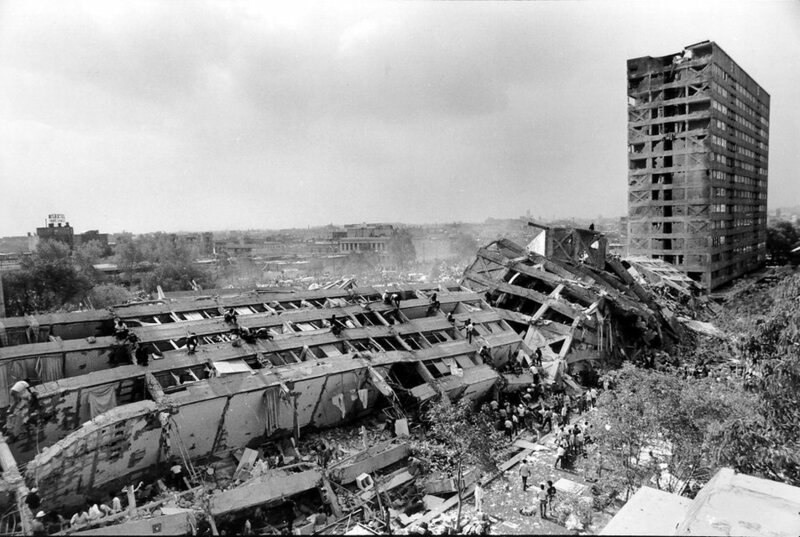 Several buildings collapsed in ’85, killing hundreds of residents, and others had to be demolished in the aftermath. The development was evacuated, and eventually, as buildings proved safe to inhabit, life began again in Tlatelolco. At present the neighborhood hosts 40,000 residents, only about half the residents it did at its peak. Today the buildings are aging, and much of the public space goes somewhat unmaintained, but the benefits of the original design are palpable—the peace of being away from busy streets, the amount of public space to play sports and hang out with friends just outside your doorstep. The amount of light and air that the Mario Pani and his team of architects provided for residents is a far cry from the city’s roots in the Centro. The connections to my research of urbanization at the edges of the city are deep. In the wake of President Miguel Alemán and Pani’s ad hoc effort here, the Mexican government in 1972 founded INFONAVIT, a federal agency that for decades would build hundreds of similar (if scaled-down) housing projects across the country, many of them in D.F. In the 1990s, INFONAVIT would exit the design and construction business, choosing instead to fund private developers to build affordable housing—in the form of distant, predominantly single family housing on the edges of the city, like my former home in Cuautitlán. Pani was, before the construction of Tlatelolco was even completed, already working on the designs for the upper-class, single-family suburb in Satélite. In some ways, the seeds of the contemporary (wealthy) private housing and (subsidized) government housing were laid in Tlatelolco, though their architectural styles would have little to do with the monumental blocks still on display. If Tlatelolco hadn’t been the site of a painful national tragedy, or if the specific construction techniques not proven to be inadequate in the face of the destruction of ’85, perhaps the idea wouldn’t have been so totally abandoned. Though such master-planned housing blocks seem to have lost favor throughout the world, the idea has done much for cities; Stuyvesant Town in New York remains a rare seat of the middle class in Manhattan, for example, and council housing in London has its many defenders. Even the stereotypically poverty-stricken and dysfunctional publicly-funded housing projects in the U.S. can’t be written off. It’s difficult to picture a 2015 in which the government was building housing—with cutting edge architects, no less—on the edge of the city, but standing in Tlatelolco, a monument to an ambitious movement in Mexican governance, it isn’t impossible. My thanks to Alfred for this field trip, and, as always, check in on my Instagram to follow along more closely between blog posts.